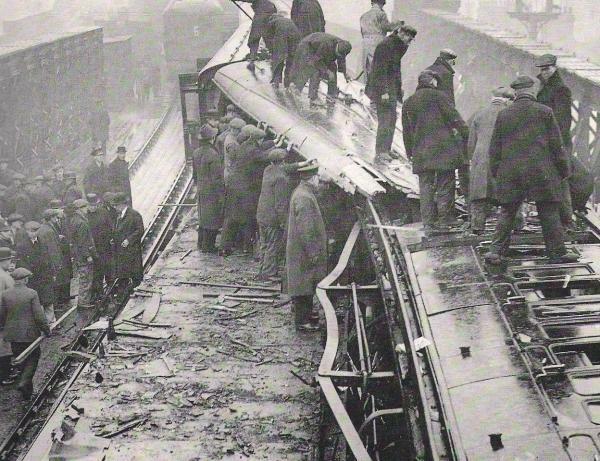 An accident occurred soon after 8.2. a.m on the 2nd April at Battersea Park, on the Central Section of the Southern Railway. Park up local home signal. telescoped the body of the rear (motor) coach of the London Bridge train, and fell over to the right on to the down local line. passengers in the two trains, in the proportion of roughly 1 to 2 1/2, the loading, as usual, being heavier in front than in rear. Seating capacity was 652 and 662 respectively. travelling on duty. Seven passenger were also seriously injured, and ten others as well as motorman A. Anthony and guard R.W. subsequently, of minor injuries and shock. station attendant on receiving information by telephone. followed at 8.20 a.m. by doctors, police tenders, etc., after which the removal to hospital of the injured persons commenced. The last case of shock left at about 10.20 a.m.
for handling traffic, reflected credit on all concerned. Visibility was poor, and there was drizzling rain. circuit. There was no damaged to signalling equipment. mounted on the under frames. were undamaged, no windows even being broken. rest of the train, only one side buffer casting was affected. coaches in star formation. It was fortunate that this did not happen, as the collision took place on a viaduct. are designated down local, up local, down main, and up main. South London line joins the local lines. The next box north of Battersea Park is Battersea Pier “A,” 534 yards distant. outermost of a drop of electro mechanical equipments, which were installed between this point and Victoria about 30 years ago. slides with 19 spare. Trains are described on Walker type transmitters and receivers. presence of a train standing at the signal if a wheel is not depressing the treadle. satisfied that the train has passed the clearance point, and that he can properly send the out of section bell signal. train has passed the clearance point, which in this case is the starting signal (No.66) in advance of the box. has been given, or when the entering section signal is received, and to keep it applied until the train has passed the starter. the home signal can only be released, with the co-operation of the Battersea Pier “A” signalman, by using the same button A.
which have to be set in the proper position so that the release shall be received on the desired signal. in order and re-seal the case. The failure must be reported in due course. (a) The 7.54 a.m. down electric passenger train, Victoria to Beckenham passed on the down local at 7.57 a.m., at booked time. (b) A light engine Stewarts Lane to Victoria , left Battersea Park at 7.58 a.m. on the up main. (c) The 7.56 a.m. down electric passenger train, Victoria to Epsom, passed on the down main at 7.59 a.m. at booked time. London Bridge train on the up local. 7.59 1/2 a.m., where it stood till soon after 8.2 a.m. when the collision occurred. forward, was brought to stand over the junction, as the result of loss of power when the collision occurred. Junction at about 8.1 1/2 a.m.
down main, was stopped, as already described, at about 8.3. a.m., between Battersea Park and the site of the accident. Battersea Pier “A” at about 8.2 a.m.
was stopped at Pouparts Junction at 8.6 a.m.
became front locked, even after point lever No.5 had been pulled, and, in consequence, he had to take steps to free the slide. signals, and it collided with the rear of train (e) just as signal No.67 had been lowered. a.m. to 8.1 a.m. inclusive; further, that a train was due to pass on each of the four lines in the minute 8.3 a.m. to 8.4 a.m.
inclusive. This is a total of 10 movements in the seven minutes, 7.57 a.m. to 8.4 a.m. inclusive. from 54 to 61 and during the evening peak, 5.30 p.m. to 6.30 p.m., from 57 to 65.
over which there us a 20 minute service in each direction. was discontinued and the booking lad removed. train was able to coast into Victoria. forward, the effects of the collision would not have been so serious. Junction, the Pouparts distant was passed at caution; the outer and inner homes, Nos. 8 and 18, were clear. When the starter, No. for empty trains going to Selhurst for repairs. site; there was, however, no trace of flats on any of the wheels. train ahead, Anthony thought that he would have been able to have reduced speed considerably before the collision occurred. emphatically stated that he would not have lowered the starter for the latter without acceptance by bell signal. Q. - Supposing you had not received the train out of section signal for the 7.30 a.m.? A.- I should have waited about two minutes and then called up the box in advance and asked if the previous train had arrived. Q.- Do the regulations allow you to offer forward the is line clear (3-1) when your block indicator is in raised position? A.- Yes, I am absolutely certain. the (2-1) on the bell? A.- I cannot recollect this, but as a practical signalman it would not strike me as very irregular if I did. Q.- On this occasion it is only your memory on which you are dependent to say got the block bells? A.- Yes, but I am absolutely certain. Q.- Supposing you had not received this out of section you would still have offered the train? A.- No, I should have called him up on the telephone. Q.- When did you last fail to get an out of section during the last seven weeks you have been at Pouparts Junction? A.- I cannot think of one during that time, and it is such a rare thing I should ring at once. Q.- Supposing you saw the block indicator fall and you did not hear the bell, you would not hesitate to offer a train forward? without receiving the block bells in addition to the indicator falling. trains had also been held previously; possibly the delay on this occasion was due to the operation of the light engine at 7.58 a.m. He had never experienced a false clear failure on the up local Sykes instrument; had there been one he would have noticed it. of the switch hook at Battersea Park was absolutely essential, though not so at Pouparts Junction. 9.0 a.m. till 2.0 p.m., and he had therefore had been 16 hours rest when he took over Battersea Park. starting signals on the up main in the wrong order. which no doubt he was, having regard to the movements already described. or worried, and knew what he was doing and what he wanted to do, viz. the release of slide No.64. also said that he had seen it done when he served as a box boy at Grosvenor Road. one of the permanent signalman been present he would not have acted as he did. transmitted (and misread) immediately before the release of the plunger when the case was open. A.- No, I do not admit them at all. Q.- You agree that both these actions must have happened, and emanated from your box? A.- Yes, but whatever happened I never saw it, and know nothing about it. I have no knowledge of it. Q.- You do agree that both these things must have happened in your box? Q.- To have released your plunger with your chest, you must have operated this cancelling ticket in some way? Q.- The switch hook must have been off then? Q.- How do you account for it being off? A.- I cannot account for it. Q.- Were you using the switch hook? Q.- Are you used to using the switch hook? Q.- When you had used the switch hook, when do you apply it? A.- On the second signal, as a rule. Q.- When you receive and acknowledge it, do you apply the switch hook? A.- As a rule, if I am at that end of the cabin. Q.- You do not do it invariably? A.- It depends which end of the cabin I am. Q.- You have two bells? A.- Yes, they are duplicate bells. Q.- Did the people who taught you this cabin say anything to you about the hook? A.- No, I watched them and asked the reason why they used the hook. Q.- What did they say? A.- Because the arm (Pouparts block indicator) being on the home signal, it would come down when I put the home signal up. A.- It could not have been on, but I thought it was. It was on when I pulled the home signal afterwards. Q.- Do you remember putting it on? A.- No, I don’t remember. Q.- Sometime between the plunge for the Coulsdon and the pulling of the home signal it must have been on? A.- I cannot say exactly when it was. Q.- Why do you think you replaced the switch hook over the plunger when you pulled No.67 signal. A.- I don’t remember putting the switch hook on at all; all I remember, it was on there when I pulled No.67. Q.- Did you put the switch hook on just before you pulled the home signal? A.- I cannot remember; I pulled the home and looked down the hook and it was on. Q.- You don’t remember putting the switch hook on for the purpose of pulling the home signal? supervised Childs and thought him fit to assume responsibility; he left him to work the box by himself under peak traffic. transmitting theft of section signal in one movement. particularly as a relief signalman was involved. I was impressed with the frankness Harvey’s evidence on this matter generally. break seals in the front case. example, Streatham and Windmill Bridge. men to lose his head under pressure. used the switch hook on every occasion after plunging his acceptance, and if he had not used it I should have noticed. A.- I know h has told you several things, but I am only telling you from my observations. Q.- Actually you did not mention the switch hook as you were watching him? 12. Reference has already been made to Childs’ demonstration to Colonel Hall, two hours after the accident. Chief Inspector R.
when apparently he wanted a front lock release, to enable him to pull his own slide. Electrical Fitter Winslett also gave satisfactory evidence on various matters relating to maintenance of the equipment. responsible for a disastrous collision. attaches either to Motorman A. Anthony, who, though seriously shaken, had a remarkable escape, or to Guard R.W. Adamson. release, by means of the key, of his home signal, No.18. train, while the section was still occupied by the London Bridge train. accident, proved that all the apparatus concerned was in efficient working order, and that insulation resistance was satisfactory. feature is concerned, the installation has operated satisfactorily since the accident without attention of any kind. instrument simultaneously fell to free. by, Childs in the usual manner by bell signal. emanated from Childs, and serious responsibility therefore rests upon him. him from even a small measure of contributory responsibility. in the flagging of the South London train through the station. actions, it seems desirable to summarise what appears to have happened after he assured charge at 6.0 a.m.
arise when working a frame with which he may not be entirely familiar. the slide and lowering signal No.64. His troubles therefore began at about 7.58 a.m. under conditions of heavy traffic. charge of this box, and proved his insufficient knowledge of the equipment. been co-operating at the same time, and hence the failure to release. the handling of the equipment, and the one which directly led to the accident. front of the case back into position after slight jamming. a.m., before which time it appears to be unlikely that the cancellation took place. receipt of the entering section signal for the London Bridge train. response to the offer transmitted by Hillman saw the indicator fall. lowered for it just before the collision. though had happened, namely, failure of the releasing apparatus, and ask for advice. comparatively easily operated electric releases, is naturally more prone to breakdown if so abused. his essential safeguard, on receipt of the entering section signal for age London Bridge train. telescoped when the leading motor coach of the Coulsdon train overrode it; the momentum of the latter train had to be absorbed. absorbing buffer, casualties might have been reduced. with regard to the circumstances at Battersea Park, the opinions of the Chief Mechanical Engineer has been recorded. except after removal of splits pins; the use of this release thus require more deliberate action. working of all equipment, and of the steps to be taken in every kind of emergency. the home signal concerned did not, of course, differ in principle from the large number of others where this block system exists. been dealt with, except the Victoria installation (Central side), and I understand that the scheme for this is under consideration. necessarily take time to mature and bring into effect. via Streatham and Croydon, to link up with the existing colour light installation between Coulsdon and Brighton.